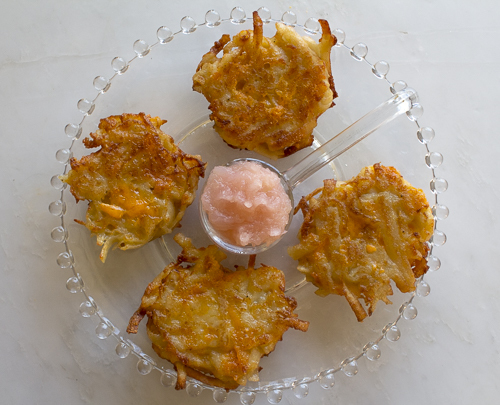 My best Latke recipes for Eight Days of Chanukah and all-year-round! 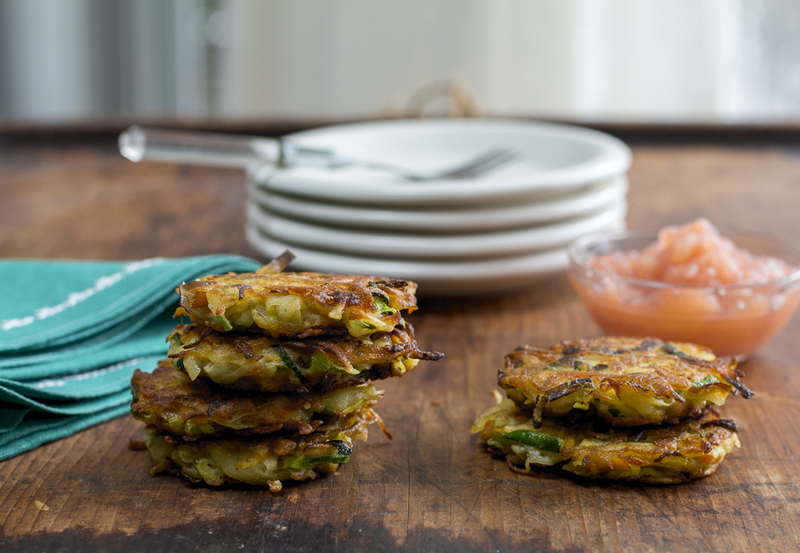 Latkes are crispy, naturally sweet, salty and irresistible! I love serving and eating them with homemade applesauce… or thinly sliced Gravlax. Tomorrow is the first night of Chanukah “the festival of lights” which keeps a burning flame shining for eight days – and oil heated on the stove for cooking traditional Jewish foods. Each family seems to have a recipe for “latkes” (Yiddish for “pancake”) which have been handed down from generation to generation. I have a master recipe, and over the years seem to add different flavor profiles with vegetables, seasonings and herbs. 1. For Crispiness: Squeeze your potatoes in a tea towel (or paper towels) until very dry. 2. For Lightness: Separate the eggs; glossy egg whites will make a lightened latke, with a meringue-type batter. For a Gluten-Free version, simply use a all-purpose gluten free flour blend in place of the flour for great results. Make your own applesauce! So much better than store-bought !! See my easy recipe. 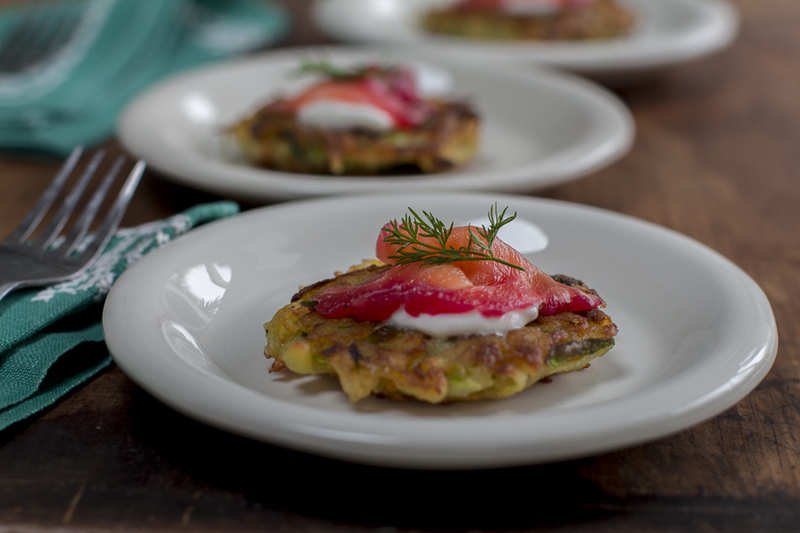 From the traditional; Karen’s Best Latkes, also try Rainbow Latkes (with veggies and beets), Mac-n-Cheese Latkes (with pasta and cheddar) – and Gravlax topped Latkes (make your own Gravlax or use thinly sliced smoked salmon) ~ takes latkes to an elevated gourmet level. 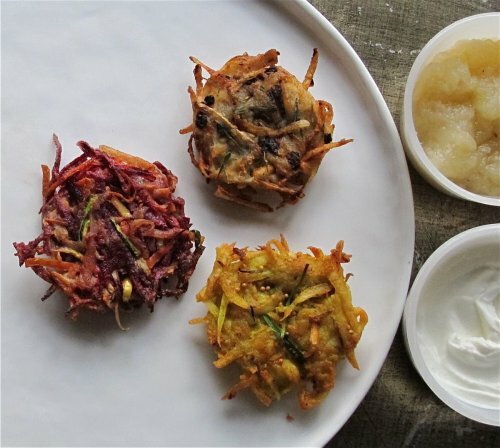 See below for two bonus recipes: Natural Potato Latkes with Black Garlic, Sage and Rosemary and Indian Spiced Latkes with Mustard Seeds and Ginger. Chanukah Latkes are that ethereal treat; a potato mixture made by dropping large tablespoons into a skillet of shimmering, hot oil. Want to get super creative? Keep the natural skins of the potato on, and add some fermented black garlic and fall herbs. Heat a large heavy skillet, add vegetable oil to about 1/4″ high in pan. Place on low heat. Make latke batter: Grate potatoes over a large cutting board. Gather up the potatoes in paper towels, and squeeze dry (this insures crispy latkes). Place them in a large bowl and add the egg yolks, sweet onion, elephant garlic, salt, pepper, sage, rosemary, black garlic and flour. Mix to incorporate ingredients. Turn heat up to medium high under the skillet. Whip the egg whites until soft peaks form. Add them to the potato mixture gently, in two additions, with a rubber spatula. When just blended in, add heaping tablespoons into the skillet. Work quickly, make about 11 at a time. Turn over when golden. Turn the heat down to medium. Cook on second side until golden and done. Repeat with the remaining mixture. Serve with sour cream and home-made applesauce (recipe below). Potatoes get spiked with tumeric, curry, mustard seeds and freshly grated ginger. Make latke batter: Peel potatoes and grate them on a cutting board. Gather up the potatoes in paper towels, and squeeze dry (this insures crispy latkes). Place them in a large bowl and add the leeks, egg yolks, mustard seeds, ginger, tumeric, curry powder, salt, pepper and flour. Mix to incorporate ingredients. Turn heat up to medium high under the skillet. Whip the egg whites until soft peaks form. Add them to the potato mixture gently, in two additions, with a rubber spatula. When just blended in, add heaping tablespoons into the skillet. Serve with sour cream and home-made applesauce.